Mario Party 10 isn't far away, arriving in the West - along with the Super Mario amiibo range - on 20th March. Its minigames have come a long way from the days of destroying Nintendo 64 analogue sticks; waggle, pointing and gyroscopic movement and aiming are now more common. 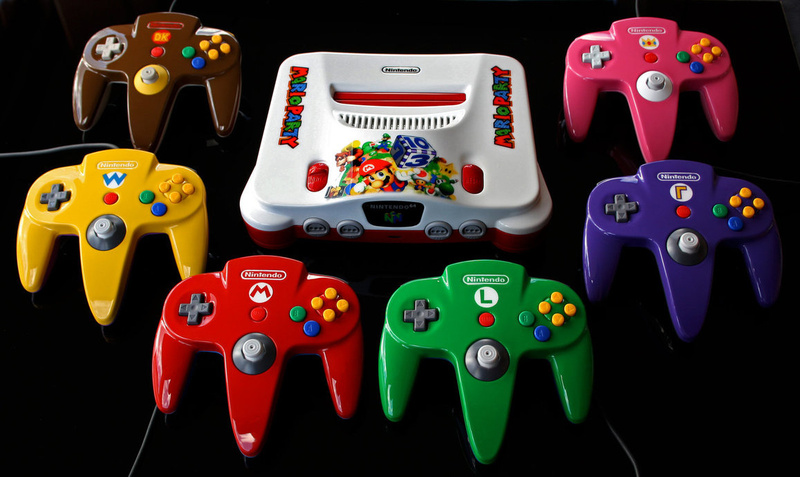 For some it's a case of go retro or go home, however, and this custom Nintendo 64 and controllers from Zoki64 will certainly be appealing to that demographic. The character-specific pads remind us of a mix of Nintendo's special Wii Remote designs and GameCube controllers from third-parties such as PDP. They look rather nice to us. Just remember not to use your palms on the sticks in the tougher minigames - that doesn't end well. Best Borat impression: Very nice! How much? Wow, I would love to have that! I mean, pretty much the only reason I have an N64 in my room is to play Mario Party 3 on it! The Waluigi controller would be mine! Why Waluigi instead of Yoshi? says Mike the TV from ReBoot. Zoki is a great dude and his work is unbelievably amazing. Love this set, esp. the two-tones of the controllers. Well done! I really wished, Nintendo would make a clasic Mario Party next time, or at least include the clasic mode with good minigames ^^"
@Josaku I'm pretty sure Mario Party 10 does feature the "classic mode" where everyone can move independently from one another. Currently, only one board uses the same play style as Mario Party 9 (where everyone moves together in a car), this time while trying to escape Bowser. That's horrible. That poor, poor N64. @gefflt You are wrong, though. The Classic Mode is like in Mario Party 9 (on all five boards) and while Bowser Party changes some aspects of the gameplay (fifth player, four other players play together, goal: staying alive until the end of the board), the rest is basically the same as in classic mode. Amiibo Party is the only mode that uses core mechanics of the old Mario Party formula. That's so cool! 😄 I'd like to see more fan projects like this. @scamander My mistake... I tried to find the specific details somewhere but was unable to do so. May I ask where you found that information? @gefflt Looking at all the footage of the game I could find from trailers, yeah the classic mode is the car mechanic from 9 with a 'sort of' classic Mario party side game that uses the figurines around a small square board. Not sure why Ninty doesn't get the memo that we liked the old 'classic mode' more than the stupid car mechanic. Why not do something similar to Mario Party 8 where all of the boards play a bit differently? I loved that about 8 except for the waggle mini games. Maybe even, oh I don't know, have different 'omega' versions of all the boards let you choose to have the classic (pre MP9) board game mode and another option to play the car mode. Nintendo is just limiting themselves. @AshFoxX Thanks! Calling the car mechanic from Mario Party 9 the "classic mode" seems purposely misleading!? And yes, I also think having the option of playing game boards in the true "classic mode" (everyone moves independtly) or in one moving car would be the best/most logical option. I just want Mario Party 1-3 to be released on VC!